Files you carry in your pocket can be easily lost or stolen. You can thwart the thieves with these easy techniques. NarsiReddy Cheruku wants a way to encrypt files that are stored on a flash drive or external hard drive. Flash drives are easy to lose. And anything lost can fall into the wrong hands. So if you’re carrying around sensitive information in your pocket, you need to make sure those files are encrypted. You can buy a flash drive with built-in encryption, such as the DataTraveler Locker+ G3. When you plug the Locker+ in, it comes up as a 13MB, read-only drive. But once you launch the program file on that drive and enter the password that you previously setup, another drive opens up with all the storage space you paid for. That drive, of course, is inaccessible without the password. The software runs off the drive, and it can be used on multiple computers and operating systems. But I strongly recommend against using this drive’s optional cloud backup feature. It uses Dropbox, OneDrive, or whichever cloud service you pick, which at first glance seems like a nice convenience. But this feature uploads the files without its own encryption. That means you’re trusting your sensitive files to the encryption capabilities of Dropbox and similar services, and they aren’t all that secure. Find another way to backup these files—preferably one where you can can control the encryption. The DataTraveler Locker+ G3 starts at about $15 for the 8GB drive, and we've looked at other encrypted USB drives as well. If you already have a drive you want to use, consider installing ENC Security Systems’ EncryptStick. You have to install EncryptStick onto your main PC, but it runs as a portable program on any other computer. EncryptStick won’t let you access your encrypted files directly from Windows/File Explorer here. You have to use the program to access your files. From there, you can drag and drop files in and out of the container, open files into their respective programs, edit, and delete them. One nice touch: The encrypted files take up only the space they need. You can use the rest of the drive for files that don’t need protection. After a two-week trial period, EncryptStick costs $14. Regular readers know I’m a fan of VeraCrypt, a free, open-source encryption tool. There are several ways to use VeraCrypt, but I recommend creating an encrypted container (also called a volume or a vault). 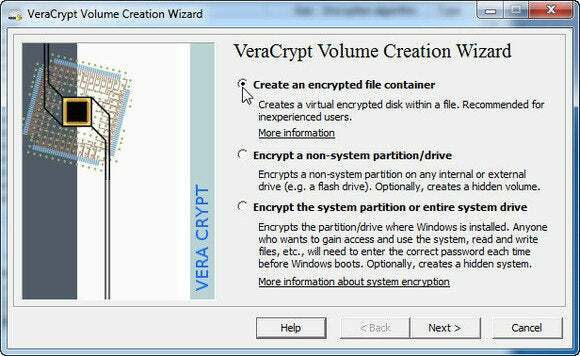 You can install VeraCrypt as a portable program. Plug in your external drive, and launch the downloaded installation program. On the page immediately after the EULA, select Extract. This will put a portable version of VeraCrypt onto your external drive. You can create a vault, of any size, on the external drive. But there’s a problem. The portable version of VeraCrypt works only if you’re using an administrator-level account or have the password for one. Or, of course, if the non-portable version is installed on the machine. This seriously limits with which computers you use the program.